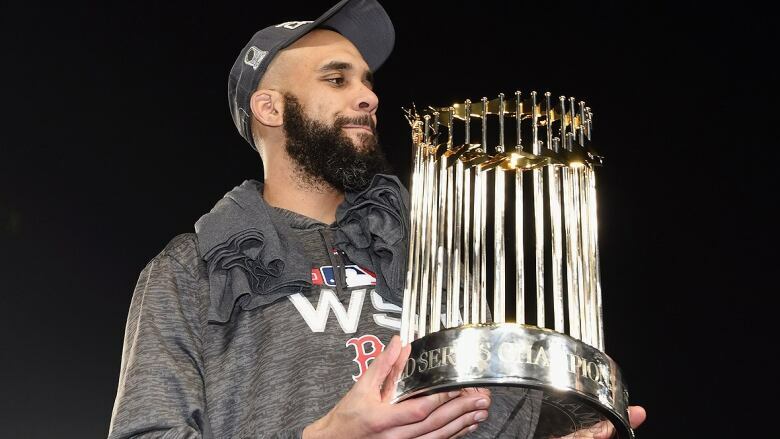 After a World Series victory that transformed him from a post-season flop to an October hero, Red Sox left-hander David Price said at the team's victory parade Wednesday that he would stay in Boston rather than opt out of his contract and become a free agent. Three days after a World Series victory that transformed him from a post-season flop to an October hero, Red Sox left-hander David Price said at the team's victory parade Wednesday that he would stay in Boston rather than opt out of his contract and become a free agent. Price will earn $127 million US over the next four years, the remainder of a seven-year, $217 million deal he signed before the 2016 season that gave him the right to opt out after the third year. It remains the richest contract ever for a pitcher. The 2012 American League Cy Young Award winner, Price has gone 31-19 with a 3.74 earned-run average in three seasons in Boston but until this year never had any success in the playoffs. He had never won a post-season start in his career — a 0-9 record in his first 10 tries — and was booed off the field after recording just five outs in the Division Series against the New York Yankees. In all, Price was 3-1 with a 3.46 ERA this post-season and 2-0 with a 1.98 ERA in two starts and one relief appearance against the Dodgers. The Boston Herald reported Price lost a 3-2 vote to first baseman Steve Pearce for the World Series MVP. Henry called it "great news" that Price had opted in. Reminded that the ball club itself, like Price, has had a bit of a turnaround after a long history of post-season failure, Henry said: "Boston is a great place to get the monkey off your back."